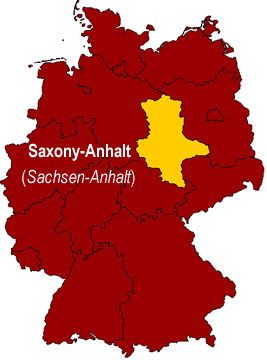 The state of Saxony-Anhalt (Sachsen-Anhalt) lies in the eastern part of Germany. The state is bordered by the German states of Lower Saxony (Niedersachsen), Brandenburg, Saxony (Sachsen), and Thuringia (Thüringen). 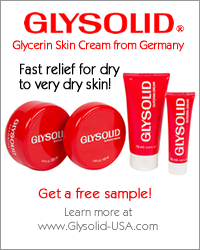 Saxony-Anhalt is very important to both German and world history. Magdenburg was home to Otto I, the founder of the Holy Roman Empire of the German Nation. It was in Wittenberg in 1517 that Martin Luther publicized his theses against the the Catholic Church, thereby ushering in the Reformation. Also, two of the leading musicians of the baroque period, George Frideric Handel and Georg Philipp Telemann, were born in Halle and Magdeburg respectively. Johann Sebastian Bach also lived and worked here for many years. The food industry is the state's leading industrial sector. industry has focused on meat and sausages production, sugar and sweets industry, dairy industry, beverage industry and grain processing. Saale-Unstrut valley is the northernmost wine-growing region in Germany. Other important industries in the state include the automotive industry, biotechnology, information and communication technology and the service sector. Cooking in Saxony-Anhalt is flavorful and seasonal. The cuisine benefits from a large variety of ingredients grown locally. The favorite vegetables used in the Saxony-Anhalt cuisine are potatoes, onions, carrots, peas, beans, asparagus, cauliflower, and other types of cabbage. The favorite meat is pork, which is also used in making different kinds of wurst. Game and fish are also served frequently, thanks to the local forests and lakes. Saxony-Anhalt is home to Germany's oldest chocolate factory, the Halloren Chocolate Factory (Halloren Schokoladenfabrik). Germany's most northern wine region, the Saale-Unstrut wine region, is located in the German state of Saxony-Anhalt (Sachsen-Anhalt), with a little portion stretching over into the state of Thuringia (Thüringen). The dominant wine types produced here are the Müller-Thurgau, Weissburgunder, Silvaner, and Kerner. Saxony-Anhalt also has a long tradition of breweries. The state is home to the world's oldest beer brand, Garley, which has been brewed here since 1314. 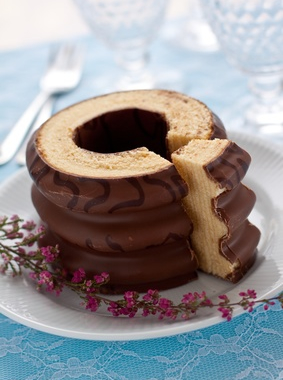 Popular foods and dishes in Saxony-Anhalt are listed below. The five largest cities (in terms of population) of the state of Saxony-Anhalt are listed below. Halle is the largest city in Saxony-Anhalt. It has a population of 232,000 (as of December 2007). The technology and food industries are the most important industies here. Halle is the home of the Halloren Chocolate Factory (Halloren Schokoladenfabrik) - Germany's oldest chocolate factory. Magdeburg is capital of Saxony-Anhalt and its second largest city. It has a population of 226,000 (as of December 2006). The origins of Magdeburg date back to the year 805AD. It is one of the oldest cities of the newest states (those that were once part of East Germany). Magdeburg was once an imperial palatinate, a member of the Hanseatic League and a Prussian Fortress. Dessau-Rosslau, the third largest city in Saxony-Anhalt, has a population of 90,000 (as of July 2007). Dessau-Rosslau was formed on July 1, 2007, by the joining of two smaller cities, Dessau and Rosslau. Saxony-Anhalts's fourth largest city is Bitterfeld-Wolfen, which has a population of 47,000 (as of July 2007). Bitterfeld-Wolfen was formed on July 1, 2007, by the joining of two smaller cities, Bitterfeld and Wolfen. Lutherstadt Wittenberg is the fifth largest city in Saxony-Anhalt. It has a population of 46,000 (as of December 2006). Wittenberg was once one of the most important cities of the politcal, cultural, and artistic movements in the 16th century. It was in Wittenberg that the Reformation began (1517).